One of the most common causes of tree decline or death is imbalance of water demand and supply. When water demand of a fruit tree is higher than supply, drought stress occurs. Drought stress causes wilting, yellowing of the leaves, advanced leaf fall, and premature fruit ripening or fruit drop. Often, drought stress is associated with heat stress during the hot summer months. When drought stress and heat stress coincide, scorching of the leaves occurs in addition to the symptoms mentioned previously. When leaves are scorched, their edges dry out, and the leaves turn brown. Due to considerable differences in root growth, rootstocks have great influence on drought tolerance of apple trees. Large, established trees with deep roots and trees on standard-sized or semi-dwarfing rootstocks, such as M.26 and MM.111, tolerate short periods of drought. Young or newly planted trees and trees on dwarf rootstocks, such as M.27 or M.9, with shallow root zones are more sensitive to drought stress. Moreover, dwarfing stocks bear more fruit per leaf area than standard-sized or semi-dwarfing stocks, and the presence of the relatively large number of fruit significantly increases transpirational water loss under such stress conditions. Excess water (water stress or flooding) is just as damaging as not enough water (figs. 1, 2). Excess soil moisture excludes oxygen from the soil, resulting in severe injury to the root system. Tree roots in waterlogged soils stop growing, minerals are not absorbed, leaves turn yellow and remain small, and finally roots begin to die. The yellowing of leaves generally starts on the lower part of the tree on the inside of the crown and then moves outward. Premature fruit ripening and significant decrease in fruit quality is characteristic for trees in water-saturated soils. Besides this primary damage to the tree and fruits, the root system becomes more susceptible to infections of phytopathogen microorganisms in “wet-feet” conditions. Often, apple trees in poorly drained areas are infected by Phytophthora root and crown rot, slowly declining over one or more years. Figure 1. 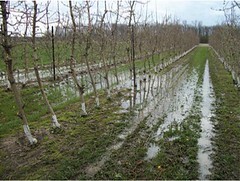 Early spring flooding in a high-density apple orchard. 'Golden Delicious' on B.9. Photo: Jozef Racsko. Figure 2. Severe flooding during fruit growth and development results in premature fruit ripening and subsequent tree death. 'Pinova' on M.9. Photo: Jozef Racsko. Certain rootstocks have some resistance to problems caused by excess water, and other rootstocks are particularly susceptible to those problems. The dwarfing M.9 rootstock is relatively resistant to both flooding stress and Phytophthora root and crown rot disease. M.7 and MM.111 are moderately susceptible, MM.106 is susceptible, and MM.104 is highly susceptible. 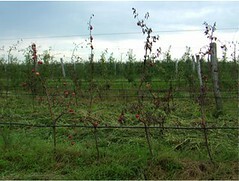 Drought tolerance of apple rootstocks: Olien, W.C. and Lakso, A.N. 1984. A comparison of the dwarfing character and water relations of five apple rootstocks. Acta Hort. 146: 151-158. Atkinson, C.J., Policarpo, M., Webster, A.D. and Kuden, A.M. 1999. Drought tolerance of apple rootstocks: Production and partitioning of dry matter. Plant and Soil 206: 223- 235. Flooding stress on fruit crops: Schaffer, B., Andersen, P.C. and Ploetz, R.C. 1992. Responses of fruit crops to flooding, p. Hort. Rev. 13: 257-313.